Prominent & Leading Manufacturer from Ambala, we offer gas heated absorption refrigeration unit, cutaway model hermetic refrigerant compressor, experimental module refrigeration system, set of training panels expansion, domestic air conditioning controls and refrigerant compressor fault simulator. Unlike mechanically driven compression refrigeration systems, absorption systems use thermal energy directly. There are three circuits in the system a water circuit, an ammonia circuit and a hydrogen circuit. The system comprises a generator, a condenser, an evaporator with a downstream gas heat exchanger, an absorber and a liquid heat exchanger. The generator is heated with gas not electricity. The unit can therefore be operated independent of the mains electricity. A supply of propane gas is necessary for operation. 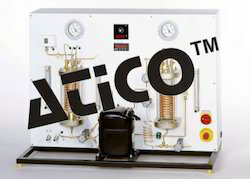 Advanced Technocracy Inc. is Manufacturer, Exporter & Supplier of Cutaway Model Hermetic Refrigerant Compressor. Hermetic refrigerant compressors like, e.g., the have a welded sheet steel housing. The drive motor and refrigerant compressor are fitted in this capsule. Unlike open compressors, the refrigerant compressor is directly connected to the drive motor and therefore does not require any floating seal. The motor compressor is suspended by springs in the capsular housing which minimises the transmission of vibration to the capsule body, thereby reducing noise emission. 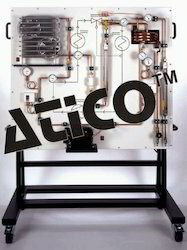 Advanced Technocracy Inc. is Manufacturer, Exporter & Supplier of Experimental Module Refrigeration System. The facilitates fundamental experiments in the area of refrigeration engineering. The unit contains a closed refrigerant circuit with open compressor, a condenser with switchable fan and an evaporator in a refrigeration box with transparent door and an adjustable heat load. The compressor is powered by a V-belt using the drive unit HM 365. A pressure controller prevents unacceptable pressures through electromagnetic opening of a bypass valve. All temperatures, pressures, the speed of the compressor, the heat load and the refrigerant mass flow rate are recorded electronically, indicated on digital displays and transferred to a PC (not included). The software and the data acquisition card are part of the unit. 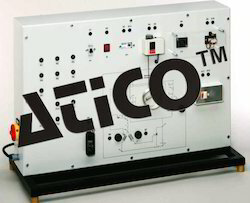 Consists of 15 different training panels that can be mounted modularly on the basic unit. 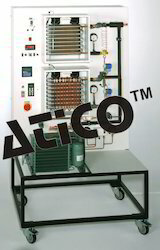 These panels enlarge the scope of experiments of realised with the basic unit, training panels included in and accessories in comprises more complex refrigerant components as capacity controller, suction pressure controller, defrost timer, four-way reversing valve and case controller. A four-way reversing valve is used to reverse the cycle. A frozen evaporator can be defrosted with a reversed cycle. The evaporator is then temporarily used as a condenser. The unit facilitates the investigation of electrical components used in air conditioning. This includes fault simulation and faultfinding on a compressor and fan motor. These devices are simulated with this unit. During this process the switch state of the equipment is indicated by signal lamps that are arranged on the display and control panel. The related starting, safety and control devices are also clearly laid on the front panel. Laboratory sockets facilitate access to measured points in the electrical circuit. The simulation of 15 faults that can be enabled via the electrical system is performed using push buttons. The series was designed primarily for training on refrigeration and air conditioning systems and is particularly suitable for use in small student groups. 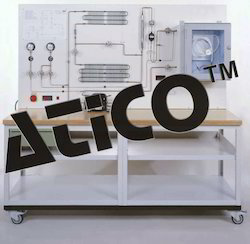 The table unit is part of a series designed for training in refrigeration engineering. The unit addresses electrical faults as they can occur in the operation of a commonly available refrigerant compressor. The faults are simulated using pushbuttons on the front panel of the unit. Other components as, a switch box with the starting relay, running capacitor, starting capacitor and motor protection circuit breaker are also arranged on the front panel. The measured points in the electrical circuit are accessed using laboratory sockets. A circuit diagram printed on the front panel provides information on the circuit. A multimeter is included for fault-finding. The unit addresses the problem of oil return in refrigerant circuits. In refrigerant circuits the lubricant is carried through the pipe system by the refrigerant. Oil may impact the compressor if the system is overfilled. If the system is underfilled the compressor may run dry. The selection of the correct diameter and arrangement of pipework is therefore of key importance. The effect of the refrigerant flow rate on the oil return to the compressor is demonstrated on this unit with the aid of glass intake pipes. A complete refrigerant circuit is mounted on the rear of the demonstration panel. To demonstrate the effect of different pipe diameters and routing, individual sections can be selected using ball valves. Pressures and flow rates are measured in the refrigerant circuit. 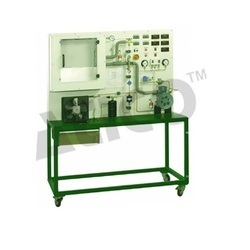 The laboratory trolley mounted system is flexible and suitable for use in different seminar or training rooms. The contains a hermetic compressor, 4 heat exchangers, 3 expansion valves and 4 different interchangeable capillaries. The unit can be operated in different modes. 11 manually operated valves allow corresponding changes to be made to the refrigeration circuit. The relevant measured values are displayed directly on indicator instruments. Therefore, sequences and consequences of switching operations within a cooling unit can be directly investigated. Sight glasses in the refrigerant circuit allow direct observation of the refrigerant status. A coaxial tube bundle heat exchanger can be operated as a counterflow condenser or as a parallel flow evaporator. This heat exchanger is used to heat or cool a glycol/water mixture circuit. Refrigerating loads are created by different fan speeds on the finned tube evaporators. This unit demonstrates several possible ways of regulating the capacity. The cooling capacity of the system with 2 separate evaporators can be changed by adjusting the speed of the open compressor. The compressor drive motor is controlled using a frequency converter. The evaporators are in individual insulated compartments. In the first compartment the temperature is regulated using an intake pressure controller and thermostat (mechanical regulation), in the second compartment using a case controller (electronic regulation). In both cooling compartments a cooling load can be generated using an electrical heater. Fans ensure even temperature distribution. A bypass capacity regulator is installed in the refrigerant circuit that connects the high and low pressure sides of the compressor. The system is equipped with temperature sensors at all relevant measuring points. The signals provided by these sensors are also used by the case controller. Advanced Technocracy Inc. is Manufacturer, Exporter & Supplier of Single Chamber Refrigerator Module. The experimental set-up is clearly arranged on a metal board which is placed on the base unit. The pipe connection between base unit and auxiliary module is made via self-locking Schrader valves. 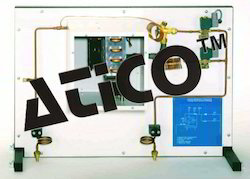 The individual components of the unit, in this case temperature control, fans, heater, compressor and solenoid valves, are controlled by the software (included in the scope of supply of the base unit). The refrigerating capacity is generated by an evaporator in an enclosed chamber. A blower is used to help achieve the even distribution of temperatures in the chamber. In addition, a heater can be used to simulate a cooling load. Solenoid valves permit the operation of the unit with a capillary tube or with an expansion valve as the expansion element. The system demonstrates the operation of a compression refrigeration unit. A closed, insulated chamber is cooled using a refrigeration circuit comprising a compressor, condenser, evaporator and capillary tube. A special feature is the ability to enlarge the heat exchange area of the condenser by switching in a 2nd stage. It is possible to use the unit to simulate faults. The intake and delivery pressure of the compressor are indicated on pressure gauges with an additional temperature scale for the refrigerant and recorded using pressure transducers. Temperature sensors measure the relevant temperatures. Their values are indicated on a digital display with selector switch. A further switchable display indicates the voltage, current and power consumption of the compressor. At the same time, the measured data can be displayed and processed on a PC. A data acquisition card with appropriate software is included. 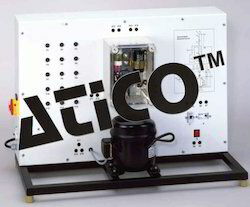 The heat transferred to and from a refrigeration circuit can be investigated with this compact benchtop unit. 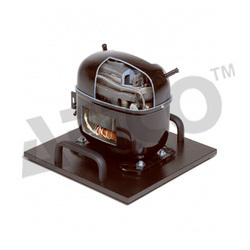 The evaporator contains two electrical heaters that are used as a cooling load. The motor torque for the open compressor is measured using a spring balance. The heat dissipated can be determined by measuring the temperature change and flow rate of the cooling water. An environmentally friendly refrigerant is used. A supply of cooling water is required. 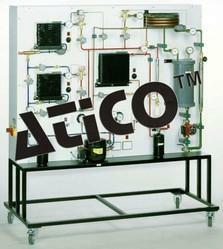 Advanced Technocracy Inc. is Manufacturer, Exporter & Supplier of Refrigeration Technology Demonstration Panel. The system is designed for the demonstration of the cyclic process on the p-h state diagram. The experimental set-up is clearly arranged on a metal panel with a system schematic. The use of commercially available components such as a finned pipe condenser and coaxial evaporator ensure a high degree of relevance to practice. A cooling load can be applied to the evaporator using water connections. Instruments enable the processes in a cooling system to be investigated and the energy transfers balanced. A supply of water is required. The panel can be mounted on the Universal Stand. Consists of a filled tool box made of plastic. 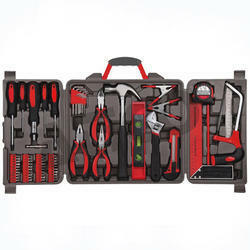 The following tools will be supplied, one piece each pipe cutter, adjustable spanner, crimping tool with threaded cutter for bolts, tube flaring unit, universal deburrer, side cutter, cable stripping knife, crimping tool for wire ends, wire stripper, set of hexagon keys (7 pieces), set of pipe bending pliers (3 pieces), set of screw drivers, completely insulated (4x slotted, 2x Philips), set of combination spanners (19 pieces), a leakage detector for several refrigerant gases and a voltage tester. 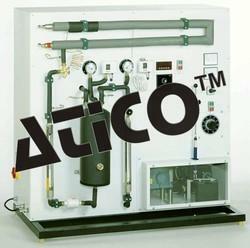 Advanced Technocracy Inc. is Manufacturer, Exporter & Supplier of Vapour Compression Refrigeration Cycle. 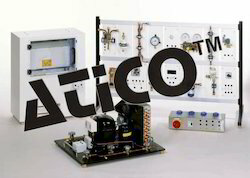 A simple refrigeration circuit is demonstrated with this clearly laid out benchtop unit. 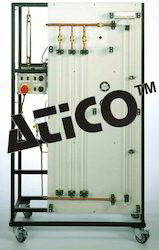 The evaporation and condensation processes are easily observed through the glass components. The function of the expansion valve (in the form of a float valve) can be seen. The changes in the refrigerant state can also be followed by measuring pressures and temperatures. A special environmentally friendly refrigerant is used at low pressure. Looking for Refrigeration and Air Conditioning ?